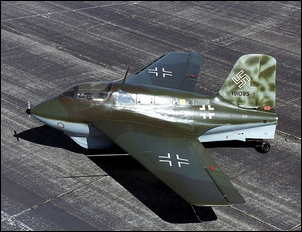 The Messerschmitt Me 163 Komet of World War II is one of the most remarkable aircraft ever produced. Not only was it the first (and only) tail-less, rocket-powered aircraft to see service, but it also held the unofficial aircraft speed record and could climb at a simply stunning rate. Designed to shoot down Allied bombers, the aircraft had sufficient climb performance to be scrambled from base when the high altitude bombers were almost overhead. But it must be said, the Me163 also had some less pleasant aspects – like fuel that in an accident could literally dissolve its pilot, a total engine operating time per sortie of under 10 minutes, and the requirement for a very high landing speed…. while unpowered. The genesis of the ME163 was predicated on two technological breakthroughs – and of course the political environment of Nazi Germany where high technology military developments were well funded. 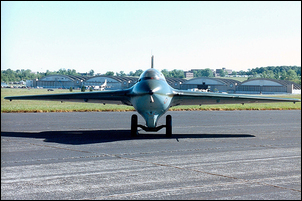 The first technological development was in the development of radical, tail-less aircraft. Following WWI, Germany was prevented from developing powered aircraft that could be used for military purposes. However, designing and builders gliders was permitted, and the best of the contemporary German aircraft designers (and, subsequently, German pilots) were involved with gliders. One such designer was Alexander Martin Lippisch. The other significant technological development of the era was in rocketry. 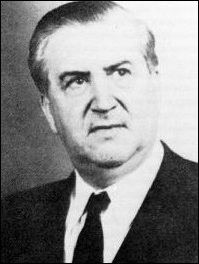 In the mid 1930s, Hellmuth Walter left his position at the German Army Ordnance Department and set himself up in business. Walter’s main business interest was in the development of rockets. Funded by all three German armed services, by 1936 he was developing rockets for aircraft propulsion. 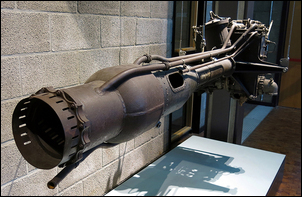 Two types of rocket engine were produced – they could be differentiated into ‘cold’ and ‘hot’ types, the nomenclature depending on the chamber temperature achieved during the burn. The Walter RI-203 development model was an 882lb thrust engine fuelled by a mixture of T-Stoff (80 percent hydrogen peroxide with oxyquinoline or phosphate as a stabilizer, and 20 percent water) and Z-Stoff (an aqueous solution of calcium permanganate). This engine was experimentally flown in a Heinkel He176 V1 on June 20, 1939. The He176 was a single seat, pressurised aircraft with small elliptical wings. It was the world’s first aircraft designed from scratch to be powered by a rocket. However, performance was below expectations. 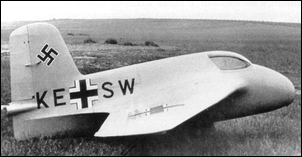 The Reich Air Ministry then ordered the German Research Institute for Gliding Flight (DFS) to produce a new aircraft based on the DFS 39, a tailless aircraft designed by Alexander Lippisch. This new aircraft was to use the Walter rocket motor. DFS 39 had wing-tip mounted rudders. Lippisch realised that these would likely flutter, and that a central fin and rudder would give better control. 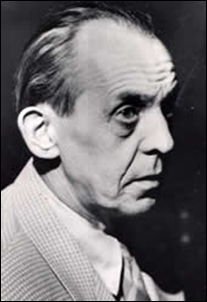 So was born the DFS 194. Initially known only as Design X (the ‘194’ designation came later), the aircraft was developed under very tight security. In fact security was so strict that Lippisch and his team had no detailed data on the rocket engine that was to propel the aircraft! They knew only general information on the motor’s size, weight and thrust specification, but had no detailed drawings. The DFS facilities proving to be ill-equipped to build the metal fuselage of the 194, Lippisch and his team transferred in January 1939 to the Messerschmitt company. The airframe was completed in 1940 and sent to Peenemünde West airfield for installation of a Walter RI-203. Ground runs of the aircraft commenced in October 1939 but the engine installation, where the engine was integrated with the fuselage (only the fuel and compressor air-lines could be easily removed) was found to be unsound. The aircraft never flew under rocket power; however, gliding tests were carried out. Despite these unimpressive beginnings, it was decided that three development prototypes be constructed – these were later officially designated as the Messerschmitt Me163 A, Versions 1-3. The Me163A V1 was completed during early 1941. Unpowered flight testing commenced in the spring of 1941, before the aircraft was shipped to Peenemünde West for installation of a 1653lb thrust Walter RII-203 rocket motor. The new rocket motor was easily removable from the airframe and could be manually regulated in thrust by the pilot over the range of 331lb to full thrust. Furthermore, the engine could be cut and then re-lit by the pilot while in flight. But the rocket engine proved to be erratic in its performance - explosions and accidents occurred. However, on October 2, 1941, an Me163A was towed to an altitude of 13,000 feet. There, the pilot started the rocket motor and accelerated. Observers on the ground, watching through binoculars and other visual tracking instruments, suddenly saw the long black smoke trail from the rocket engine waver – and then stop. The pilot, travelling at just under 1000 km/h, had lost control of the tiny aircraft. Shutting off the engine, the pilot slowly gained control and was then able to glide back to base to make a normal landing. The loss of control had occurred as the aircraft ran into compressibility effects – the change in the way that air behaves when nearing the speed of sound. The loss of control was of course incomprehensible at the time - the Me163A had just gone faster than any other aircraft and little was known of the problems of compressibility. Recording instruments in the aircraft showed that it had reached 1004 km/h – a world record. In war time this was of course kept secret – the Allies having no aircraft that could travel even remotely as fast. Based on the performance of the Me163 A, it was decided that a new model of Me163 aircraft be developed – the B series. While appearing similar in many respects, these new aircraft represented almost a complete redesign. In order to hold more fuel, the fuselage was larger. A small propeller was added to the front to power a generator for the 24V electrics. A much more powerful rocket motor was also fitted. The Walter 109-509A motor produced no less than 3300lb of thrust and used a more volatile fuel mixture of T-Stoff (80 percent hydrogen peroxide and 20 percent water) and C-Stoff (hydrazine hydrate, methyl alcohol, and water). However, the motor was again quite unreliable. Aircraft could explode on engine start-up, the engine could cut out when experiencing even fractional negative ‘g’, and the engines sometimes stopped just as the aircraft were getting airborne. Furthermore, the aircraft took off on a wheeled trolley that was then dropped. If dropped at the wrong time, the trolley could bounce back up into the air, hitting the aircraft. Landing was on a skid, and heavy landings caused pilot injuries. The fuel was so dangerous that pilots and ground crew wore protective suits, but in a crash these were of little use. In one crash in which the pilot died, parts of his head and arm were literally dissolved away by the fuel. 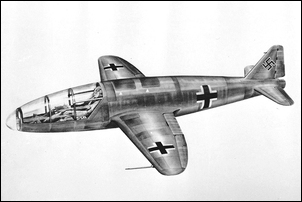 However, once in the air and with the rocket motor operating, the Me163 B had extraordinary performance. 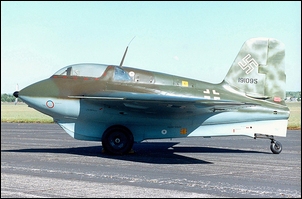 Including take-off time, the Me163 B could reach 32,000 feet in an incredible 3 minutes and 19 seconds! To reach 40,000 feet took just 3 minutes and 45 seconds. One source quotes an in initial climb rate of 16,000 feet per minute. Compare that with the Spitfire that had an initial rate of climb of just 4,700 feet per minute. Maximum service speed of the ME163B? In the region of 960 km/h. The Spitfire? 630 km/h. However, the ME163B had a practical range of only about 130km, much of that unpowered (the aircraft would glide back to its airfield). The maximum duration of rocket power was only 7 minutes and 30 seconds. So why develop such a sophisticated aircraft with such a short range? Was the decision to go ahead with the development of the ME163B fatally flawed? The answer is ‘yes’ – but only in retrospect. 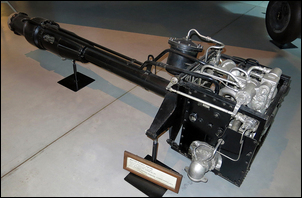 At the time, the Walter company was promising a rocket motor with much greater duration – in fact a motor firing time that would have made the aircraft far more practical in a strategic sense. Furthermore, the relative speed of the ME163B versus the bombers it was meant to shoot down required the development of new gun aiming devices. Without these developments, the window of time in which the pilot could manually fire the guns was too short for consistently successful results. To put this another way: the war ended before the aircraft could be developed to its full potential. As was the case with a wide variety of advanced German technology, after the war the victors took examples of the ME163B home. However – and unlike the V2 missile – none was subsequently flown. Attempts were made, but the aircraft (built under huge time pressures and with a shortage of raw materials) was not durable – one that was to be flown in the US started to delaminate its wooden wings. The very tricky handling of the highly dangerous fuel was also a disincentive to trial flights. But that’s not to say that the ME163 led nowhere: the first aircraft to exceed the speed of sound was the rocket-powered Bell X-1, and the fastest aircraft of all time (the X-14) was also rocket powered. And after WWII swept-back wings also made a sudden appearance in US, UK and Soviet aircraft…. Examples of the ME163B can be seen in many museums around the world, including the War Memorial in Canberra, Australia; the Science Museum in London, UK; and the Smithsonian Aircraft and Space Museum in Washington DC, USA. If you have the opportunity, go and marvel at a tiny, incredible and very brave aircraft. While not as clearly associated with the use of slave labour as the V2 missile and other advanced Nazi technology projects, it is likely that components of the ME163 aircraft were produced by workers subjected to grossly inhumane conditions. When marvelling at the technologies produced under the Nazi regime, one should never forget the other terrible and dark side to this era.